When you need a bigger display, have no worries. A 3 gallon Scoop Bin With Sliding Cover Set is the answer. 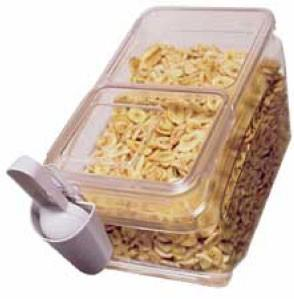 Large scoop bins are perfect for your larger candies such as saltwater taffy and wrapped chocolates, as well as, items usually purchased in a larger bulk amount such as grains, dried fruit, pasta, or even pet food. Those shopping in your location will be able to easily reach inside with the scoop and help yourself. No tight fit here! Tritan scoop bins give you the option to make a bigger display, which requires less restocking time. Fill up once and be sure that it will be a while before customers are able to empty that large bin. 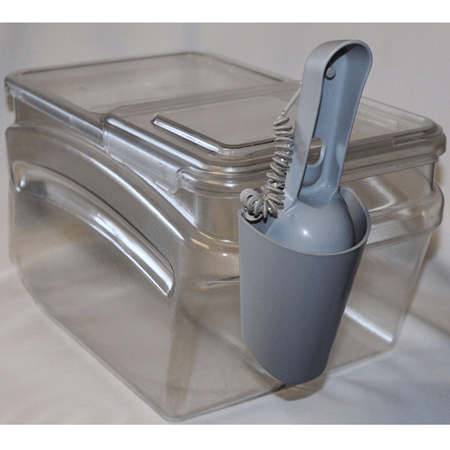 This poly-carbonate bin is 35 times stronger than the traditional acrylic containers. These seamless bins are durable and easy to maintain with the added benefit of being stain resistant. Customers can choose their items with no concern for freshness since each of these bins are tight fitting along with the added automatic rotation feature. This insures that the first products loaded in are the first ones out. You won't be digging through older merchandise, it will always be the newer items. Get yours today!